Our goal is to serve you and your family. We want you to exchange ordinary healthcare for extraordinary wellbeing at Millar Chiropractic Clinics. We strive for excellence by giving you friendly and prompt service, along with personalized Chiropractic care. In return, you will receive restored health and a new outlook on wellness. At Millar Chiropractic Clinics we want you to experience “Results that Change Your Life”. Percentage of patients that rated their visits at Millar Chiropractic Clinics as "Excellent or Very Good"
Percentage of patients that said they would refer their family and friends to Millar Chiropractic Clinics. Percentage of patients that said they usually did not not have to wait more than 10 min before being seen. We're a modern complete group of chiropractic practices committed to the diagnosis, treatment, rehabilitation and prevention of injuries and diseases of the musculoskeletal system. We offer complete spine care and sports care with manual and instrument adjusting, massage, muscle and soft tissue work, full therapy and complete rehab with laser, decompression traction, disc pump and more. 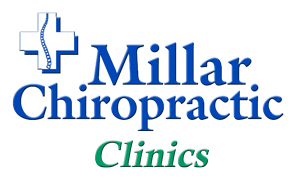 Whether you’re dealing with injuries or pain from living life, sports injuries, on-the-job injuries, general pain complaints, a little back pain or severe disc and spinal diseases and disorders, Millar Chiropractic Clinics is the only chiropractic resource you need. 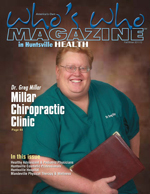 Millar Chiropractic Clinics was started by Dr Greg Millar, Chiropractic Physician, in 1998 and now has 6 clinics in Huntsville, Madison, and Jones Valley Alabama. Our Doctors are committed to practicing with "Chiropractic Excellence" "Without Drugs or Surgery." All of our chiropractors were hand chosen and further trained by Dr Greg Millar, DC CCEP and the other Millar Doctors like Ken Randolph, DC ASBCE, former member of the AL Board of Chiropractic for 11 years. Millar Chiropractic is where "Years of Experience and Knowhow" meets "State of the Art" equipment and "Compassionate Caring." Add in a skilled support staff combined to create the right stuff for excellence in chiropractic care. Millar Chiropractic makes every effort to ensure that care is readily accessible to those in need. We strive to provide multiple locations, timely appointments to accommodate patients and we deliver prompt and accurate communications to keep patients informed at all times. It is our policy never to rush a patient nor to compromise care as we believe quality care knows no time frame. Dr Millar is fond of saying, "You need a Chiropractor and a Medical Doctor. You need a Medical Doctor for in sickness and a Chiropractic Doctor for in health." Millar Chiropractic is dedicated to treating the whole body not just this or that part. We believe the entire body is connected. Our Doctors are well trained in spine care, the extremities (shoulder, elbow, wrist, hand/hip, knee, ankle, foot) as well as trained in Nutrition, Vitamins, Wellness and Longevity. Most people would rather be healthy and avoid illness and disease, if they could. Unlike conventional medicine, which focuses on attempting to treat disease once it occurs, and then masking disease symptoms, Millar Chiropractic Clinics emphasize getting to the root cause of the problem. We believe in improving your health and wellness in an effort to reduce the risk of disease, illness and pain. 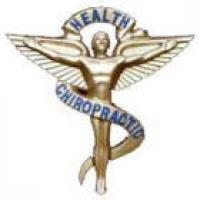 We want you to exchange ordinary health care for extraordinary wellness through Chiropractic and lifestyle changes. Dr Millar says "I don't want to take one more pill than I absolutely have to." We believe that in early stages of many diseases, lifestyle changes - including DREAM (Diet, Rest, Exercise, Adjustments, Mental State) and perhaps some vitamins, supplements, and herbs - will return the body to full health. For some, Millar ChiropracticClinics will take them back to a place that is cozy and familiar, offering a rediscovery of health and wellness that had been previously known but long lost. For others, the journey may offer a new beginning, one never before experienced. People everywhere are recognizing the benefits of alternative medicine; benefits that will help them achieve and maintain optimal health. Please take the time to meet your doctor, your wellness team, and explore our wellness network dedicated to helping you achieve your wellness objectives. To fully understand the nature of your health, we recommend you join our free website membership program. As a patient at Millar Chiropractic Clinics, we will personally tailor a wellbeing program specifically targeted to your health needs using the least invasive yet highly-effective techniques and services available. We will teach you to DREAM (Diet, Rest, Exercise, Adjustments, Mental State). We have seen remarkable results through the years with our system of healing and wellness. We want YOU to experience wellness for yourself. We will help you ask and answer the questions "How can I live longer? ", "How can I be more healthy? ", and "What do I need to do to help my family enjoy true health and wellness?" We will encourage you to not only change your lifestyle for the better but help family members to change so they may also live a longer, healthier life. Millar Chiropractic Clinic is a proud member of the UAB (University of Alabama Birmingham), Department of Neurosurgery, Chiropractic Care Team. Dr Millar and Dr Randolph have attended symposium training by UAB Neurosurgeons on clinical practice guidelines including Physical examination, Imaging (X-rays, MRIs, CTs and Mylograms and Discograms), Conditions and Differential Diagnosis, Available Treatments, and Research. For years, the neurosurgeons of the UAB Division of Neurosurgery practiced with Dr Millar treating cases and referring patients back and forth. UAB Neurosurgeons trusted us to provide Chiropractic Excellence. Now, should it be necessary, our Doctors often do the work up (order and preform tests along with trials conservative chiropractic care). We treat many patients before and after surgery. Research and the UAB Neurosurgeons will tell you that only 5% of all herniated and bulging disc cases need surgery. So 95% of all herniated and bulging disc cases need conservative treatment such as the care provided by Millar Chiropractic Clinics. Working on thousands of herniated and bulging disc cases has taught us much. Frankly it all comes down to experience and know-how.We understand what to treat and perhaps more importantly what not to treat. Our chiropractors understand that every patient does NOT get or need a manual chiropractic adjustment. In fact, most herniated and bulging disc patients are gently adjusted with Activator or Disc Pump instruments. We treat your case and every case individually as there are NO cookie cutter answers to back and neck pain. But we treat all cases with the same Chiropractic Excellence. To date we have preformed decompression traction on some 5000 patients. Results do vary. But overwhelmingly the results of decompression traction have been excellent. We also understand that part of treatment is Exercise, Rehabilitation and Stabilization. Our treatment often incorporates physiotherapy modalities (deep interferential e-stim, ultra sound, cold laser treatment), therapeutic exercise and our "Complete Rehab" program. This is where our doctors design a Custom Rehab program that starts where you are now and takes you forward to strength and endurance. We work with medical doctors every day. We will also try to work with your medical doctors, giving you continued care from doctors you already know. Over the years, we have worked cases with most of the local orthopedist and spine surgeons. They know us and we know them. We find the the combination of conservative chiropractic care merged with the traditional medical approach yields incredible results. All of our Chiropractors specialize in the non-surgical treatment of bulging, prolapsed, and herniated discs, and the radiating pain (usually arm or leg) that often accompanies disc problems. We consider the treatment of degenerative disc disease, degenerative facet problems, sacroiliitis, and arthritis of the spine our "bread and butter" so to speak. We utilize DRS Protocol and the DTS Decompression Traction Systems, The Disc Pump, Cox Flexion Distraction, Cold Laser, and other modalities including electrical stimulation, ultrasound, diathermy along with rehabilitation and core stabilization physical therapy exercises in the treatment of disc related cases. Through treating, teaching and touching lives, the Partners, Doctors and team of Millar Chiropractic strive to empower the people of the Tennessee Valley to exchange ordinary healthcare for extraordinary wellbeing through discovering and implementing chiropractic, nutrition, and whole body prevention, leading to a Wellness Lifestyle and a longer, healthier life. Over the years, we have tried to bring Chiropractic Excellence and the Wellness Lifestyle to the forefront of discussion in our area by starting the MEDLINE and BACKtalk TV shows on ABC WAAY TV Channel 31. These TV shows allowed Chiropractors and Medical Doctors to publicly discuss the benefits and pitfalls or side effects of Chiropractic vs Medical approach to health problems. See Notices and Disclaimers for further information.